As junior Angela Tan, wove through the crowd with her friends, she felt a rush of excitement. Clutching her handmade poster, she looked at the sea of people before her and smiled. 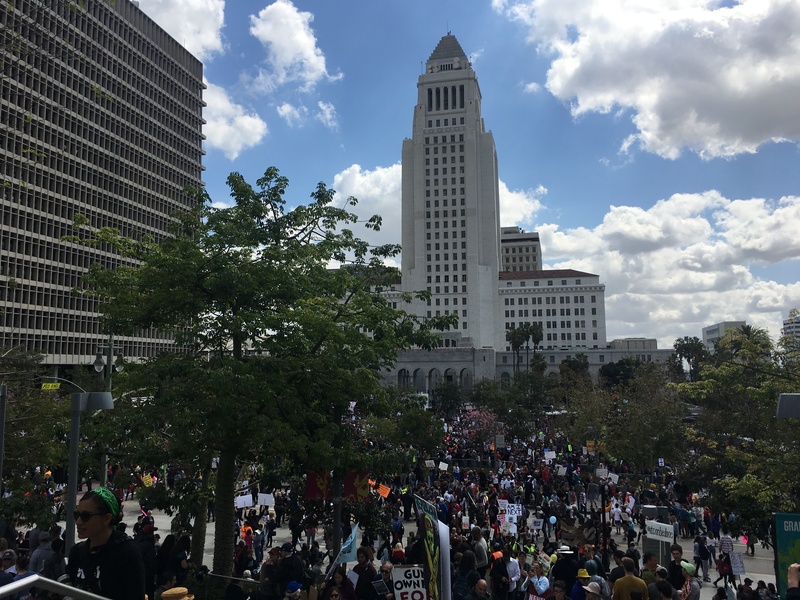 Among the towering buildings near Pershing Square in downtown Los Angeles, she spotted children brandishing signs and teens sporting colorful T-shirts. Though the streets were also packed with adults, Tan shared that the majority of the protesters in the crowd were her own age. Like Tan, dozens of other students attended March for Our Lives demonstrations March 24. Following the shooting in Parkland, Florida and National Walkout Day, the students joined thousands of other protesters to advocate for greater gun control, bring more attention to other causes, and encourage people to vote in the 2018 midterm elections. The demonstration was created and organized by #NeverAgain, a group of students who survived the shooting at Marjory Stoneman Douglas High School on Feb. 14, which was the eighth mass shooting this year according to CNN. Everytown for Gun Safety, a gun control advocacy group, helped the students plan and coordinate the event. According to a petition on the event’s website, the March for Our Lives movement hopes to pressure lawmakers to implement gun control legislation to combat the issue of gun violence, especially in schools. Chair of the Teen Outreach Committee for the March for Our Lives Foundation junior Cami Katz, worked with her mother, who is the president of the foundation, to plan the demonstration in Washington, D.C. and oversee the other marches around the nation. Other participants said they attended the march in D.C. to better demonstrate their support for the gun control victims and advocate for reform. Because his family was free during Spring Break, sophomore Jack Hoppus said they decided to attend the March for Our Lives protest at the capitol. “[I attended March for Our Lives] to spread the word that change needs to happen, and that no child ever should be in fear at school or any public space of gun violence,” Hoppus said. “If a big enough group participates, the voice of all is much louder than [of] an individual. Participants said that though they may not be of voting age, they believe it’s important to be politically active and support the gun control movement, in addition to causes like Black Lives Matter, LGBTQ+ rights and intersectional feminism. Following the march, attendees said they plan on continuing advocating for greater gun control. Several organizers have expressed their desire for another national school walkout April 20, the 19th anniversary of the Columbine High School shooting.